As we walked out with a smile of fulfillment after the satisfying thematic dance production The Porous Earth, performed by charismatic principal dancer Kiranmayee Madupu and narrator-dancer Priya Premanand, we couldn't help hoping that the dance presentation would be repeated so that we could see it again… and again, like we could see a movie! This was an unusual Bharatanatyam dance presentation, because it was a programme performed to a poem called The Porous Earth, written in English by poet, Tejdeep Kaur Menon, who is a serving senior Police Officer, and conceived and choreographed by the inestimable Guru Smt. Hemamalini Arni to music scored by Ravi Kiran, who also played flute in the live orchestra during the performance. While the narrator-dancer, Priya Premanand recited verses of the poem while dancing, she left the stage to Kiranmayee to depict the imagery of the poem in dance, using all the elements of Bharatanatyam: rhythmic and graceful body movements, hand gestures, dance steps, facial expressions & body movements to depict characters and the dramatic element, through music and dance. The drama was provided by not only the charming and innovatively concieved choreography, but also with the perfectly composed and fitting music played by the seasoned musicians in the accompanying ensemble, and by the elegant costumes, and emphatic lighting design. The poem, The Porous Earth, on which this presentation was based, is about the birth of a river, which grows from a trickle, fighting to survive, to a stream, to a mighty river traversing changing landscapes; cold and icy terrain; sunny days, reflecting white clouds and stormy weather; creating gorges and waterfalls on its way; harbouring fish, flora and water fowl, while sages and shepherds and herds of domestic and wild animals populate the river banks; where maidens bathe, and men sail and row. Man intervenes by building bridges to cross the river; canals to extend the river to irrigate crops and farms. And then dams are built to harness the river. The river then mourns its own fate when man treats it as a sewer, littering it with carcasses, dirt and sin. The river regrets losing its balance, destroying and swallowing farms and people. The river with heavy heart for what it has become, goes on to its final journey; hurrying, it surges to sink itself ‘in the arms of the sea’. The stage had no props except a blue ramp running across the width of the stage, representing a stream. 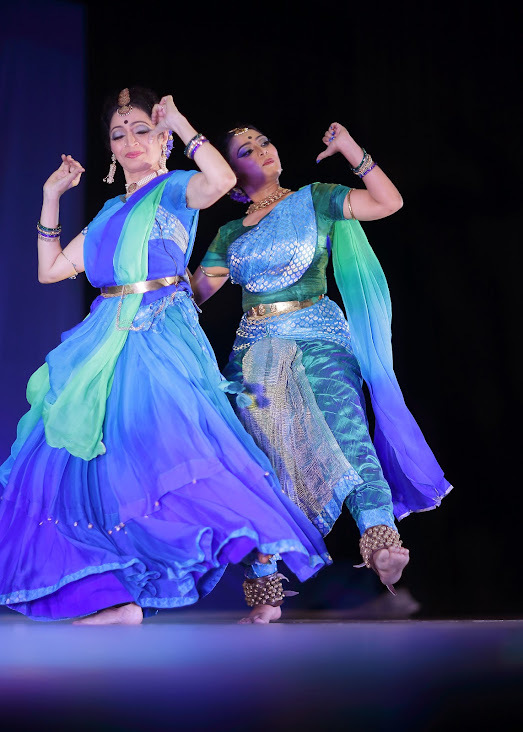 Both the dancers’ costumes were aesthetic in their simplicity – cobalt blues, aquamarines, dissolving and vignetting into turquoise, flowing into silken greens like the changing colours and moods of a river. The principal dancers’ costume, had a silvery fan and a pallu with silver motifs. And the colour of the costumes changed, with the lighting, which itself was designed to suit the mood of the dance, the words of the poem, and the variations and movements of the music. Both the dancers in the short periods that they danced together were precise and graceful with Priya having the responsibility of being the narrator of the poem, which was a casting coup of sorts, and a excellent decision by the choreographer to have one of the two dancers narrate, instead of having a recorded voice-over. Though it may have been difficult to speak expressively and dance at the same time, Priya Premanand did it with smoothness and apparent ease. Kiranmayee Madupu has charisma and a natural grace, her magnetic movements captured the eyes of the audience. Fluid and elegant, her dance has the spring of a bow and the keenness of an arrow. With a softness and lightness to her movements. Her large jumps and leaps while depicting various terrain the river traverses were vigorous, yet elegant. Her rhythmic Jaati’s, small jumps and fast, detailed footwork to the Nattuvangum, the little hand cymbals that are tapped at various angles to the different sounds of the dancer’s feet, were always fascinatingly precise. So were her midair Jumps, her alignment and symmetry delightful to see. And to me, the highlight of her dance was when she depicted menacing machinery in the building of the dam. When she made two quick tiny forward and back jumps with arms raised and a stern expression. It was so swift and expressive, that I thought I may have leaned forward and didn’t see the movement due to parallax error. But that movement created such controlled tension and release that there was a collective release of breath and applause from the audience for this. But, applause was a regular occurrence, whenever Kiranmayee completed a dance sequence. The music,the choreography and the dance were innovative, tasteful, melodious and harmonious. 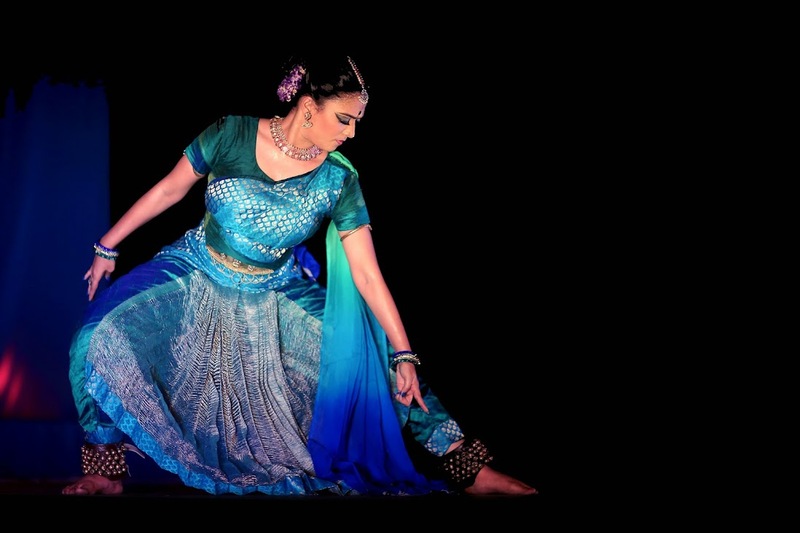 And though this was not a classic Bharatanatyam performance, it needed the knowledge, expertise and training of those steeped in the classical art. And without this experience, deep knowledge, training and skill in traditional classical Bharathanatyam, this whole presentation could not have been conceived, composed and performed with such confident grace and splendour. The music itself could stand on its own as a piece of art, but, that it was composed to interpret a Bharatanatyam dancer's conception of a poem, was a tribute to the genius of the conceiver, choreographer and Guru extraordinaire, Hemamalini Arni, the ‘Guru of Dance’ for conceptualizing a poem into dance, and, the composer and musician, Ravi Kiran to have presented the dancers and the audience a work of art that deserves to be memorialised.The musicians were - Ravi Kiran who had composed the music, on flute. Karra Srinivas whose effort on Nattuvangam and Mridangam was superlative. The faultless Kolanka Sai Kumar, on Violin. Sudhakar on Veena. Srikanth on Percussion and Tabla and Pavan Kumar on Keyboard. Credit must go to - Sudarshan Bomma - Make up, Principal dancer, Kiranmayee - Costume Design, Nagaiah – Tailor and - Surabhi Purnachandra Sekhar - Lighting. I used to wonder why film actors get so much credit and earn so much money when film making is such a team effort; the director and writers, I felt, should really get all the credit for conceiving of, and making the film that they believe in. But, now I realized why the actors get the acclaim. Because they transform an idea to reality. They make an idea real. And that’s what Kiranmayee and Priya did, they transformed an idea, in this case a poem, and the conception of a dramatic presentation of it through dance, and made it real.